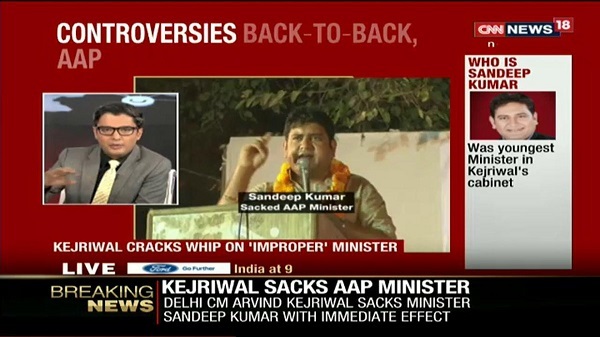 Aam Aadmi Party’s youngest minister, Sandeep Kumar was caught on camera in a compromising position with two women. THE IRONY IS SANDEEP KUMAR IS THE MINISTER FOR WOMEN AND CHILD DEVELOPMENT. It is alleged that the CD with pictures was sent to Arvind Kejriwal, the chief minister some two weeks ago, but no action was taken. Action came only after TV channels got hold of these pictures. Things seem to be getting worse. We had written about this – a lady party worker and mother was molested by a senior AAP official, and when she reported complained to Arvind Kejriwal, he said “ADJUST KARO”. She was so devastated that she committed suicide.